乳腺癌的多样性如所谓的胶样癌或黏液癌。如图可见丰富的淡蓝色黏液。癌细胞好象漂浮在黏液里，这种类型多见于较大年龄的妇女且生长较慢；要是它的组织学形态良好，预后将好于非黏液性浸润性癌。 This variant of breast cancer is known as colloid, or mucinous, carcinoma. Note the abundant bluish mucin. The carcinoma cells appear to be floating in the mucin. 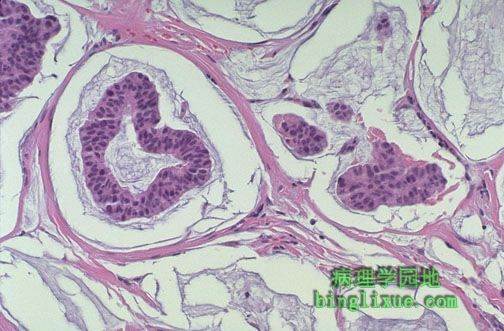 This variant tends to occur in older women and is slower growing, and if it is the predominant histologic pattern present, then the prognosis is better than for non-mucinous, invasive carcinomas.